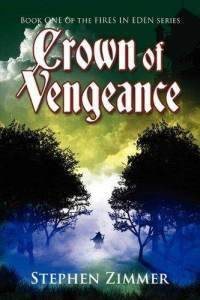 Crown of Vengeance is book one in a new fantasy series called, "Fires In Eden". When Lee, Ryan, Janus, Mershand, Ericka, Logan, Derek and a few others wish that something would happen in their lives that was extraordinary, they find themselves on a journey that promises just that. The story sets out in modern times and each, for reasons of their own, is bored with life. When a unnatural and eery fog rolls in, each person soon realizes they aren't where they began and confusion and fear set in. Each of them are now in another land, the land of Ave and in another time and they must use their individual abilities to survive. A few of them end up in the hands of the Onan, a tribe of the Five Realms and others arrive in the Saxan Kingdom. There is a war brewing as the powerful Unifer wishes to bring everyone under his one rule and destroy all those who oppose him. The Unifer is determined to allow evil reign and with his charismatic appeal, it is hard to resist his charm as he uses all his resources to set a course of action that will bring many to their knees. The group of outsiders is a bane to his existence as they always seem to end up where they weren't needed and each, in their own way, work to divert the events that are occurring. The war that is inevitable will be fought on land, in the air, water and even in other realms, as the Unifer works his silver-tongue and his magic to bring everyone to his heel. Will the group be able to set everything in order or will they be tempted to walk the path of the Unifer? I had a hard time getting into this book. I didn't enjoy the long introduction to each of the characters, it took up almost half of the book. I thought there was a lot of useless information shared and felt that their introduction could have been simpler, for the information that was shared didn't help with the overall of the book's appeal. However, whence the group travels through the fog, this is where things begin to pick up. The world building land of Ave was very well written. The people of Ave were believable and enjoyable to read and from there the stories flow picks up and you know longer feel the trudging pace of the modern day set up. I loved the fantasy aspect of the novel, all the different types of creatures was fantastic, each explained with depth and clarity. I also enjoyed watching how each of the main characters interacted with the people of Ave, especially in the beginning when everything was new and proper etiquette had yet to be noted. Their confusion and fear is common place and each reacted as one should in their given situations. The elitist aspect of the book is something everyone can relate to, even in today's times and you cannot help but hating those who are in power. The Unifer was a great antagonist. He was delivered in an intelligent and expressive way. The battle scenes were breath taking, allowing the reader to feel as if they were alongside the people, fighting their battle with them. And the overall outcome of the books plot left you begging for more. I am glad I continued to give this book my time, as I am now looking forward to reading Book Two in the Fires in Eden series. A majestic, epic fantasy that begins many adventures and journeys across a diverse and enthralling world, filled with races and creatures both familiar and new.